Leah is originally from Madison, Nebraska and is the youngest of four children. 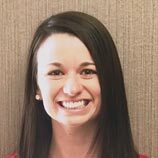 She attended Central Community College in Hastings where she completed training for Dental Hygiene and recently she earned her Bachelors in Health Care Management from Bellevue University. In May of 2018, Leah married her husband Andrew. In her spare time, she likes to read, play volleyball or run, watch the Huskers and cheer on Andrew at tractor pulls.